Oh the things I could say about Tara + Jose... they are such a beautiful couple. They truly love each other and you can feel it just in their presence. 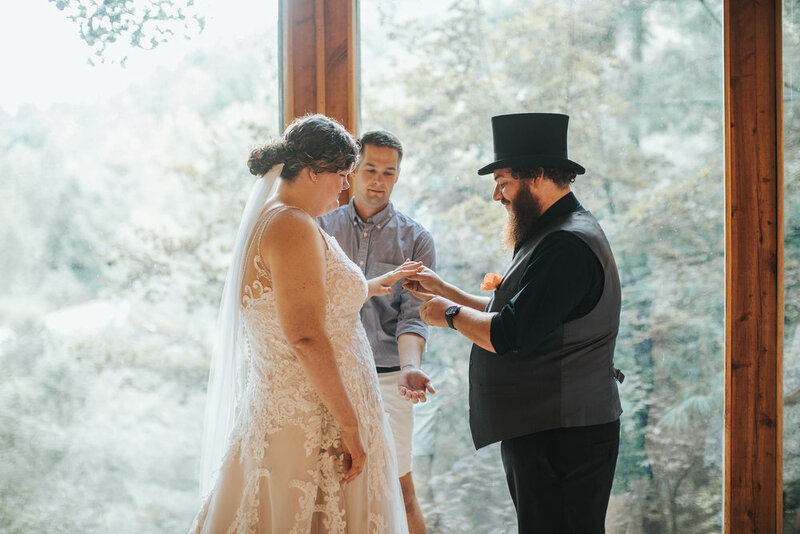 When I first walked into Jose's cabin, he was just chilling, going over his vows... I asked him if he was nervous and he said, "I just miss Tara".... my heart was so happy because I knew he was going to see her in just a bit, and I was excited for the adventure that the day would bring. Tara was in the cabin next door, along with her family, who were all coming together to prepare everything.. her sister had been making cheesecakes in the kitchen since the day before! They had originally planned to get married in the same spot Jose proposed, which was the campsite they spend a lot of their time at near the Sky Bridge. But with 100% chance of rain in the forecast, they decided to move the ceremony inside! Even with the rain, Red River Gorge was B E A U T I F U L! We soon headed upstairs so that Tara could get ready alongside her sister and best friend. Her sister did her hair, she did her makeup, and her momma helped her into her dress. 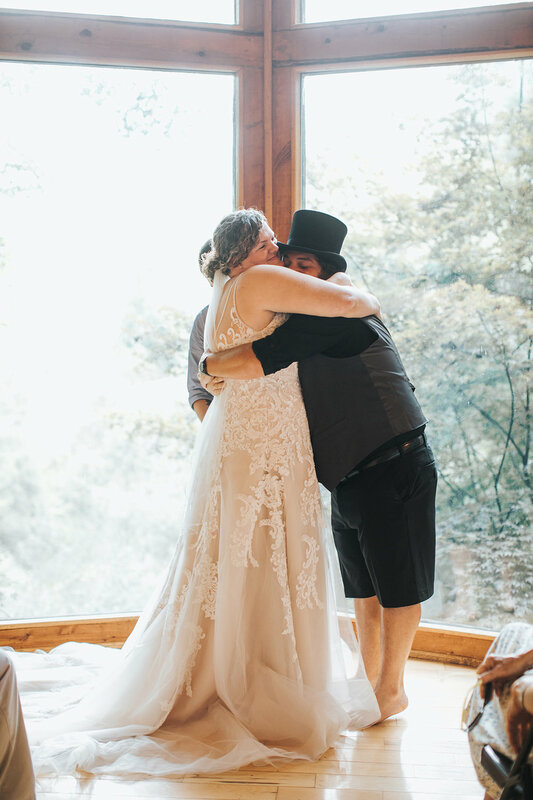 I ran downstairs to gather her father for a first look. He surprised her by wearing the shirt she got him on vacation so many years ago. Her sister told me the shirt has been a running joke in their family for years! Tara walked down the steps and her father was so happy, he tucked her into his arms so tight. Tara then pulled out a note for her momma and sister, explaining the charms on her bouquet. They were in memory of her grandmother who passed away earlier this year and they had hoped so much that she could have been there. 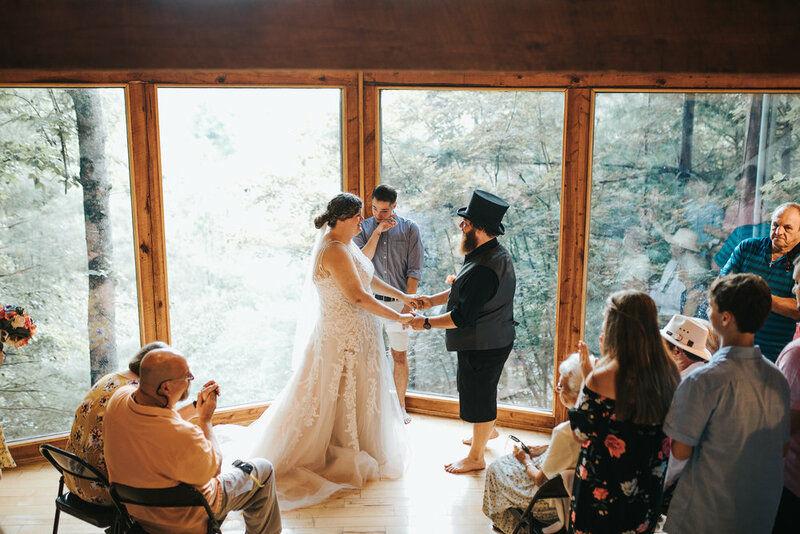 When it was time for the ceremony, their closest family and friends piled in to the cabin and made room for Tara to walk down the aisle to her future husband. At the top of the steps, she smiled so fiercely at Jose, and he smiled back at her. It was such a moment, I get cold chills when I think back on it in retrospect. She met her father at the bottom, and he walked her to Jose. 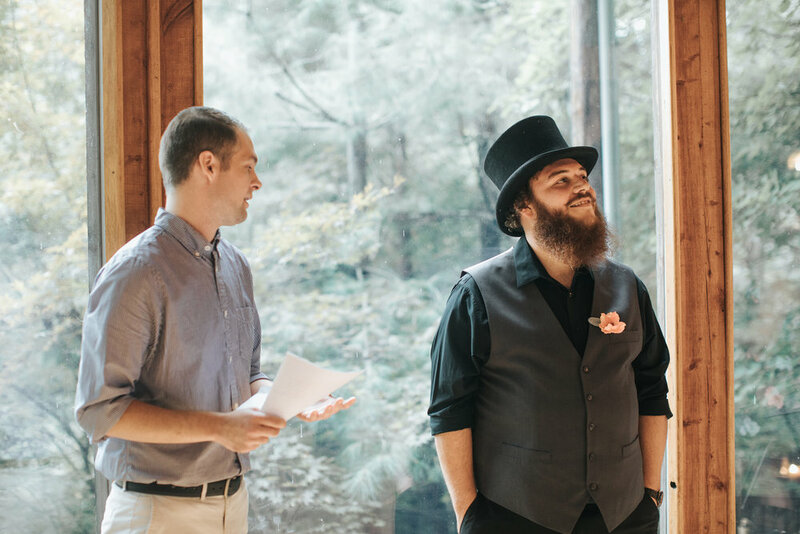 The ceremony was officiated by Tara's close special friend, Jonathan (who is so sweet, and so awesome by the way). They made sure to announce, "Put your phones away, let's live in the moment." 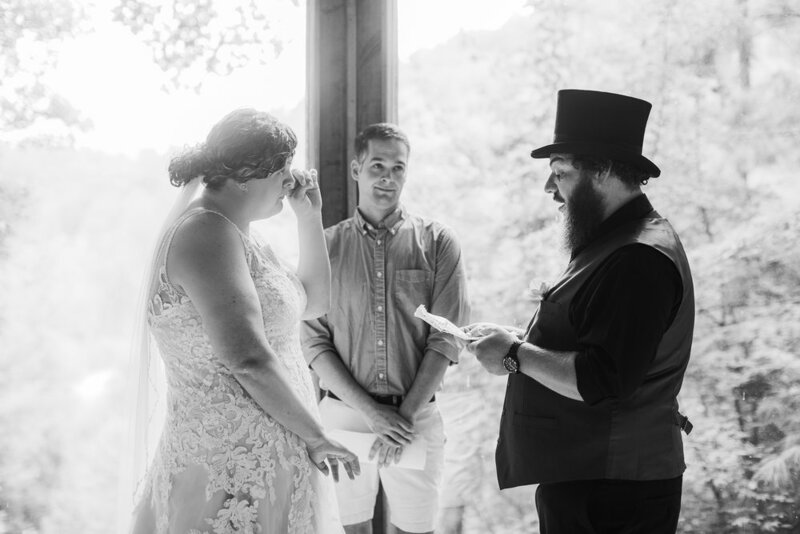 Tara and Jose wrote the most powerful vows I have ever heard. There was barely a dry eye. 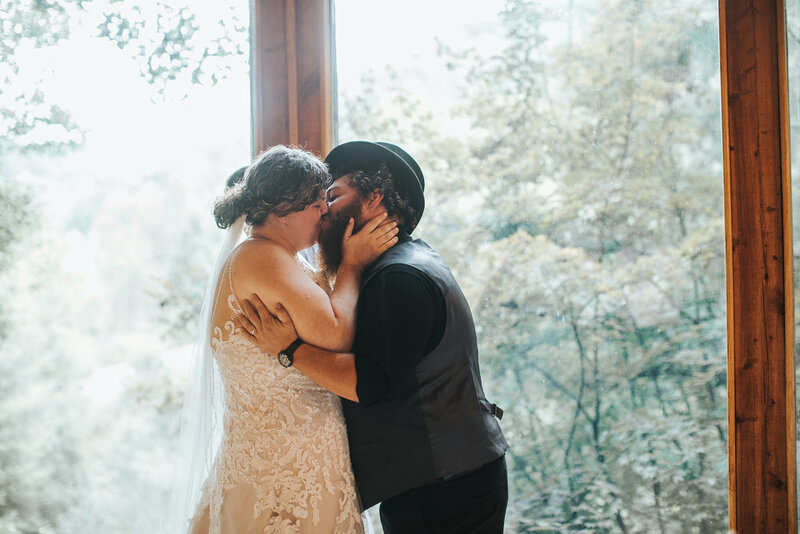 Their ceremony was so authentically them, and just so so beautiful. I have never known a more humbling kind of love. They danced on the deck in the trees, Tara with Jose, Jose with his momma, Tara with her father, and then a special dance with her mom... after the dances were finished, they went inside and Tara's momma and sister, had brought an old bottle of Whiskey that was her late grandfathers so that all of the cousins could take a shot together in memory of him. I loved that moment because it was so intimate and special for their family, AND because there wasn't ONE straight face after taking that shot. HAHAHA. Tara & Jose, I hope you have the most beautiful, magical life together. I know you are already off to an amazing start.